I'm presently doing long-term planning for my FT-5 purchase, and am now looking into the best ways to fully-enclose the FT-5 for noise and fume control. The enclosure panels must NOT be load-bearing: It should be easy (enough) to open/remove any side panel during a print without affecting the print. My present plan is for the panels to be hinged, closed against a soft foam gasket. The external corner brackets complicate the issue: I'd really rather not try to cut and seal around them. Can they be eliminated? I'm hoping some combination of corner brackets would do the trick. I'd also like a tightly sealed enclosure so I can experiment with heated-enclosure printing. It would have an adjustable air inlet to ensure fume exhaust doesn't remove too much heat. 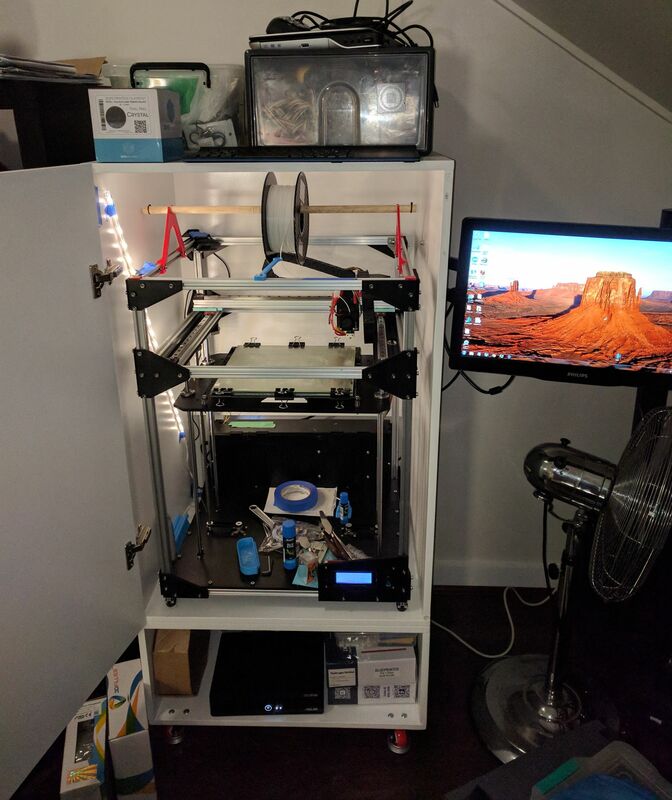 I have a friend who did a minimal enclosure for his printer: He doesn't do ABS often, so he decided not to bother with a full enclosure. He only added top and bottom panels, then wrapped the printer in stretch packing wrap (Saran wrap) and using tape to seal around the top and bottom. Which was removed and discarded after each print. I'm thinking this may be a good way to start. I have not started on enclosing my printer (and don't know if I will), but I designed the printer with an enclosure in mind. I did not use the stock side mounted brackets for this reason. I wanted to be able to affix a side panel without the brackets in the way. I opted to use 2040 corner brackets. You can take a look here. If I do enclose the printer, the plan is to use rare earth magnets to hold the panels in place. I think I would epoxi them to the face of the 2040 brackets, and the panels (assuming they were not steel). This should provide a nice clean look and a very functional seal. The panels will also be very easy to remove. The big question is how best to deal with the top. Made a fairly simple enclosure from 16mm MDF and biscuit joins (and 3mm mdf backing).. more a quick thrown together thing to keep the cats/dust out than anything - but also helps keeps the noise very quiet. Never print ABS, so given fumes weren't a concern I left a cutout at the back of the cabinet to allow cool air intake for the PSU/board etc. 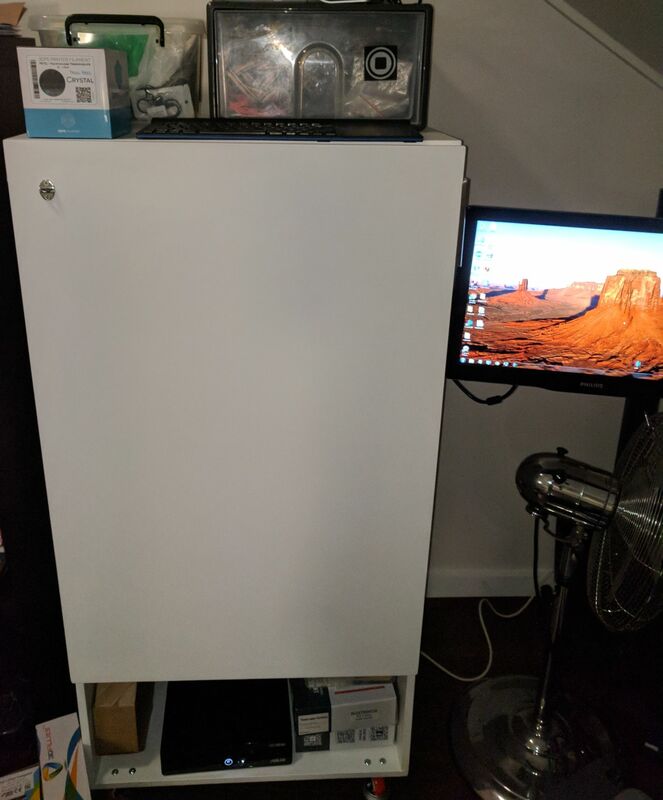 Has castors, a monitor arm, and a storage area underneath for filament/mini pc. Original plan was to incorporate an acrylic window somehow, but my hand was kind of forced to bang this enclosure together pretty quickly and move the printer to its permanent location in the loft. TBH with a webcam and teamviewer set up I monitor the print from my PC downstairs in the loungeroom, so the window isn't necessary. Defintiely need to tidy things up, old LED bar and webcam taped into place for now. Need to design an organisation rack for my glue sticks, tools etc currently hanging around the bottom of my printer too. Since the weather is heating up I definitely need to print a part cooler too, once I get around to opening the spool of PETG. PETG is kinda silly for a part cooler, isn't it? Just send it, brah! PETG is kinda silly for a part cooler, isn't it? Why would it be? It's durable and heat resistant. Perfect use for it in my book. It's actively cooled, you know that right? If you have a junk roll left over sure. It's usually twice as expensive as PLA. I've yet to have a problem with my PLA cooler 1cm from the heater block. All of my PETG lately has been the same price as PLA. It's so common now, the price has come down to PLA level. Hmm. Maybe Amazon isn't the best place then. Most of the PLA I'm seeing is $15-20, where most of the PETG is $20-30, which is roughly twice as much when averaging. Try comparing mid-range PLA and mid-range PETG. There is so far no dirt cheap PETG on the market yet that I know of. If you compare brand-for-brand it's basically the same. Well I clearly don't know what I'm talking about then. Have a great day. That is not what I am saying. I'm just pointing out that you are comparing cheap PLA prices with mid-range PETG prices. As of right now, I don't know of any cheap PETG sources. It will come though, just not yet.